£3M to re-open Abington Street – are they having a laugh?? At first I couldn’t believe my eyes, I though it must be some other town like Nottingham. £3M! £3M to open up a very short stretch of road at the top of Abington Street? Apparently it will ‘provide a vital boost’ to the local economy. The top of Abington Street is a pleasant area with trees, several pavement cafés and a wide open pedestrianised area where older people can walk at their own pace, where parents with small children can allow them to run about freely. This is going to be replaced by narrow pavements and cars. How will that revitalise the area?…. 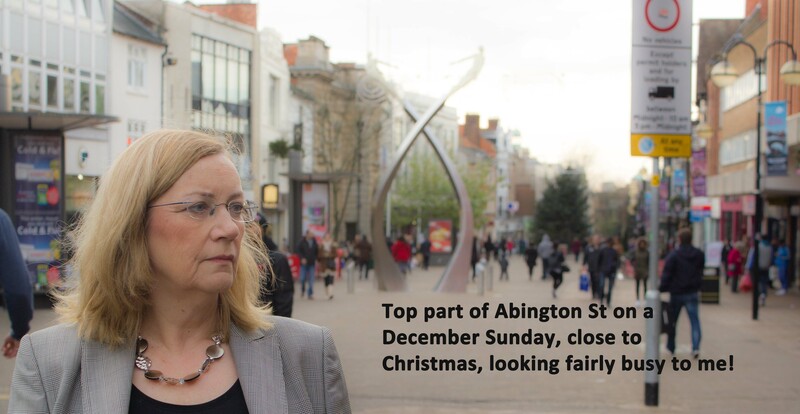 Abington Street is already struggling, in common with so many town centres as the shoppers desert the town centres in favour of out of town retail parks where they can park within a few feet of the store they want to use. There are empty shops and too many charity shops, pound shops and gambling shops. The House of Fraser is leaving the Grosvenor Centre, and the move into their premises of Primark and Next will presumably create yet another two sets of empty premises at the top of Abington Street and in the doomed and poorly designed Peacock Place. There are huge challenges in trying to keep the centre of Northampton alive, but I fail to see how wasting £3M opening up a short stretch of road and ruining all the café businesses at the top of Abington Street will ‘provide a vital boost’ to the town centre. Give me £3M and I can think of many other and better ways to try to give a boost to the town centre. How about relocating the market along the length of Abington Street, so that the traders are in the middle of the shops rather than being separate? Why not allow disabled parking in the centre of the market square and have pavement cafes all round this beautiful square – with trees all round the edge like the squares in Europe? Why not have a scheme whereby council-owned shops can be rented out to start-up retailers at very low rents for the first two years to enable them to get started, and to remove the depressing ‘missing teeth’ appearance of empty premises? Why not work with private landlords to develop a scheme along similar lines? Lots of people would like to open a shop and there are lots of empty shop premises. It doesn’t take a genius to bring the two together, just a bit of vision. The decision on this £3M will take place at the full Northampton Borough Council meeting in the Guildhall at 6pm on Monday, 9th December and again at the Cabinet meeting at 7pm on Wednesday, 10th December. I hope that lots of people will speak against this measure and that the councillors will not vote along party lines and will vote instead for common sense to prevail. If you agree with me, please email or phone your borough councillor and tell him or her which way you would like them to vote on Monday.